Korean barbecue (고기구이, gogi-gui, "meat roast") refers to the popular method in Korean cuisine of grilling meat, typically beef, pork, or chicken. Such dishes are often prepared on gas or charcoal grills built into the dining table itself. Some Korean restaurants that do not have built-in grills provide customers with portable stoves for diners to use at their tables. Alternatively, a chef uses a centrally displayed grill to prepare dishes to order. 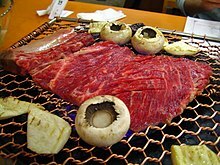 The most representative form of gogi-gui is bulgogi, usually made from thinly sliced marinated beef sirloin or tenderloin. Another popular form is galbi, made from marinated beef short ribs. However, gogi-gui also includes many other kinds of marinated and unmarinated meat dishes, and can be divided into several categories. Korean barbecue is popular in its home country, but has also gained popularity worldwide. Bulgogi is the most popular variety of Korean barbecue. Before cooking, the meat is marinated with a mixture of soy sauce, sugar, sesame oil, garlic and pepper. It is traditionally cooked using gridirons or perforated dome griddles that sit on braziers, but pan cooking has become common as well. Galbi is made with beef short ribs, marinated in a sauce that may contain soy sauce, water, garlic, sugar and sliced onions. It is believed to taste best when grilled with charcoal or soot (숯, burned wood chips). Jumulleok is short steak marinated with sesame oil, salt and pepper. It is almost similar to unmarinated gogigui and one thing that distinguishes it from other kinds is its steak-like juicy texture. Jumulleok is also commonly found with sliced duck instead of beef. Spicy pork daeji bulgogi is also a popular gogigui dish. It is different from beef bulgogi in that the marinade is not soy sauce-based, but instead, is marinated in sauces based on gochujang and/or gochu garu (Korean chili powder). Chadolbegi is a dish made from thinly sliced beef brisket, which is not marinated. It is so thin that it cooks nearly instantly as soon as it is dropped onto a heated pan. Samgyeopsal is made of thicker strips of unsalted pork belly. It has fatty areas and is tender. In Korea, samgyeopsal is eaten more frequently than chadolbegi due to the comparatively lower price of pork. It is traditionally eaten with soju (a traditional alcohol). Loins (deungshim, 등심) and boneless ribs (갈비살) are also a popular choice as an unmarinated type of gogigui. Gogi-gui comes with various banchan (side dishes). A green onion salad called pajeori and a fresh vegetable dish including lettuce, cucumbers, and peppers invariably accompany the meat dishes at restaurants. A popular way of eating Korean barbecue is to wrap the meat with lettuce and add condiments such as pajoeri (spicy scallion salad) and ssamjang (a spicy paste made of doenjang mixed with gochujang). ^ Although beef galbi is the most common form of galbi, it may also be made from pork ribs or chicken. ^ "Watch: How to Do All-You-Can-Eat Korean Barbecue Like a Pro". Eater. Retrieved 2018-03-30. 구이 (in Korean). Doosan Encyclopedia. Retrieved 2017-03-08. 구이 (in Korean). Encyclopedia of Korean Culture. Retrieved 2017-03-08. 구이 (in Korean). Empas/Encyclopædia Britannica. Retrieved 2008-03-15. 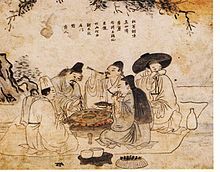 Wikimedia Commons has media related to Korean barbeque. This page was last edited on 28 March 2019, at 09:44 (UTC).